Moving Motion 24 at TUC Congress 2018, FDA President Fiona Eadie warned that bullying, harassment and sexual harassment were “fundamentally an abuse of power” and when the bully or harasser is a Member of Parliament or Government Minister, this represents “an even greater exploitation of power”. The FDA’s motion, which was supported by the College of Podiatry, was in reference to the Westminster harassment scandal that broke last Autumn and the Government’s underwhelming response in the months that followed. The FDA has been working with the civil service to review its procedures for reporting and investigating complaints. However, as Eadie told Congress, this review does not cover bullying and harassment complaints against Ministers. As it currently stands, any complaints made against a Minister ultimately end up with the Prime Minister. The FDA President condemned this process as it “ultimately means that internal party politics will always be the deciding factor”. Eadie also described the new harassment policy introduced for staff working on the Parliamentary estate, known as the Independent Complaints and Grievance Procedure, as “woefully inadequate” and vowed to “keep working to get a fully intendent process in place”. Such a policy exists for Scottish Government staff, which is currently being used to investigate complaints against former First Minister Alex Salmond. While she criticised the backlash that Leslie Evans, the civil servant tasked with carrying out that investigation, has received, Eadie commended the Scottish Government for leading the way in developing an independent process and called on the UK Government to “stop dragging their heels and do the same”. Delegates voted to carry the motion, which called upon all public bodies, including the civil service, Parliament and local authorities, to ensure there is a transparent process for reporting harassment and bullying as well as ensuring visible independence in the process of investigation and decision-making appropriate to the nature of the complaint. The FDA President also spoke to support Composite 08, which called on the Government to recognise the damage to society that has resulted from cuts to public services and reinvest in our critical public services. She told delegates that FDA members are “are in no way immune to the effects of public service cuts” and “see the damage being wreaked upon public services every day” as a result of spending cuts. 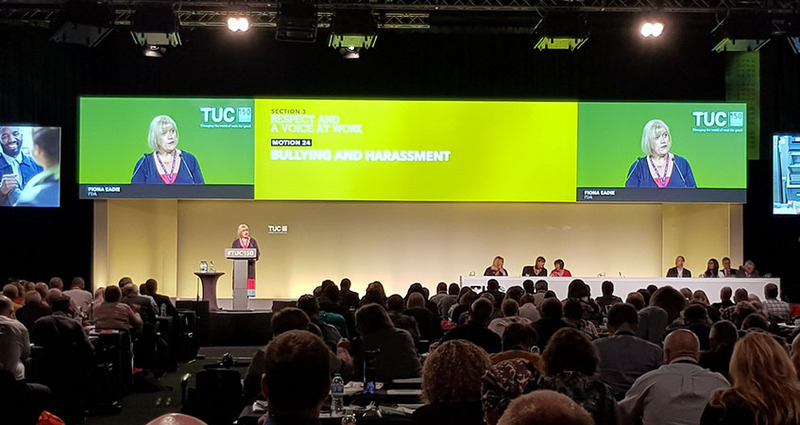 The motion, which was carried by Congress, included an amendment calling on the TUC General Council to publicly resist attacks designed to undermine the impartiality and professionalism of civil servants and others across the public sector. Eadie described civil servants as the “backbone that keep our country going” and criticised persistent attacks from the parts of the media, politicians and Ministers, telling delegates “this will not be tolerated”.